72" Dbl-Wide Bridge Frame (Only) for Std. Dust Mop 72"
Institutional application - All plastic design reduces potential for making weapons. Designed exclusively for the Dust-Grid Frames. Strong plastic construction. Ribbed grid design keeps mop flat on the floor. Strategically located Velcro tabs to secure pad to base. Fits any 7/8" to 1" diameter handle Acme or Compression Lock secures Handle, and Slide Latch secures frames to bridge. Quiet. 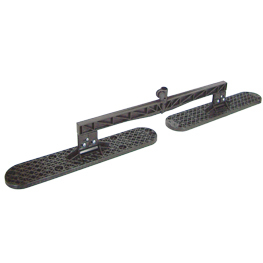 Fits AIM handle #5056, 5058 or any ACME threaded handle up to 1"
Item: 72" Dbl-Wide Bridge Frame (Only) for Std. Dust Mop 72"